Bella getting possessive of FERAL. As promised in yesterday’s review, I’ve got a nice little treat for you today… Please help me (and Bella) warmly welcome YA Author, Holly Schindler, to our little corner of the interwebs with her fun interview! Were there times when you were writing FERAL that you found yourself afraid of unexpected noises, or checking over your shoulder for stray cats or creatures lurking near the edge of the woods? It’s funny—I didn’t. But my experience with FERAL is quite different than my readers’. Anyone who picks up the book dives straight into full-blown creepiness (think jumping cannonball style into an ice-cold swimming pool). For me, the creepiness was more gradual (think edging your way into chilly water slowly, bit by bit). The book actually started out as an MG mystery, believe it or not. (When I started revising, the book started getting darker and drifting away from MG—until I felt sure it actually needed to be a YA.) The MG version was about a girl looking into a cold case—that cold case eventually turned into the far more recent death of Serena Sims as it appears in FERAL. The death always took place at school, and it always revolved around a “cheating” clue (though “cheating” took on a different meaning when it became YA), and the manner of Serena’s death was always the same. Once I knew I was going to bump the book up to YA, my main character didn’t work. (Bumping a book into a different age group SOUNDS simple enough—but oh, boy! It results in a complete and total overhaul. Trust me.) So I had to brainstorm a new seventeen-year-old protagonist. That’s when I discovered that Claire was the victim of a gang beating—that discovery made me realize the theme would be recovering from violence, and that the genre would be psychological thriller instead of straight mystery (or even horror, as I’d suspected it might be as I started to revise). I do have a loose idea for a straight teen horror novel, and it’ll be interesting to see how it feels to do the cannonball dive into dark, creepy material. I am a shameless cat lady and I was genuinely spooked by my little mews, purring contentedly beside me while I read. Where did the idea of these menacing, are-they-or-are-they-not-supernaturally-evil-felines come from? I’m actually an animal person myself. I’ve only spent three of my 37 years without an animal of some sort. I grew up with two cats I loved to pieces—Tuffy, as her name suggests, was born feral. 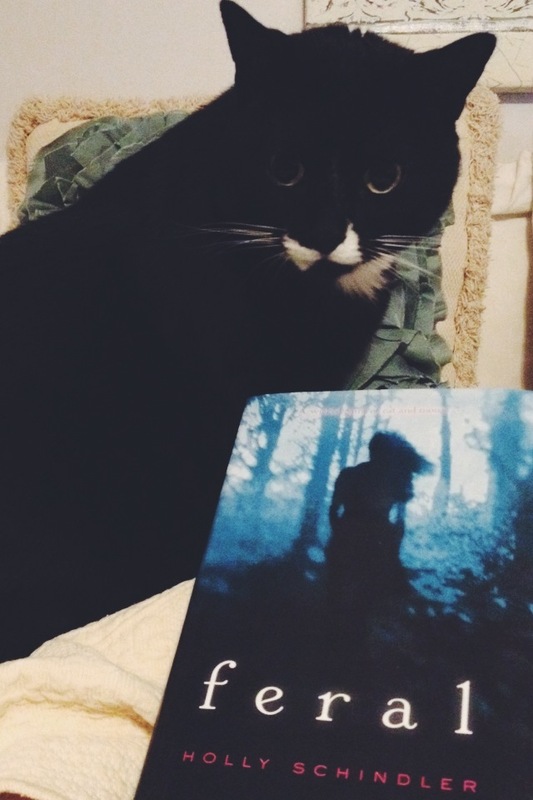 The creepy use of cats in the book has nothing to do with what I think of cats in general. I’d love to have another—right now, I’ve got the world’s most spoiled Pekingese. He’s definitely an only child. I’m not exactly sure what he’d do if I brought another animal into the house, but my suspicion is that carnage would ensue. When the book was an MG, I knew I wanted the victim’s corpse in the cold case to be torn apart by Missouri wildlife. In the original draft, it simply kept the police from accurately pinpointing the manner of death (as it also does in the final version). Once I started to move the book toward YA (and the murder became recent rather than a cold case), I knew I wanted the cats to play a bigger role. So much of Peculiar is a mirror-image of the Chicago, reminding Claire of the horrific beating—those cats are a kind of gang, too, just like the human gang that trailed Claire in Chicago. And Sweet Pea specifically also becomes the vehicle to depict how Claire feels about herself post-beating. The atmosphere was so beautifully handled and consistent throughout the entire book. You really transported the reader to this small Missouri town and brought it to life, just as if it were a movie unfolding on the big screen. Did you have any audio or visual aides you used while creating the haunted atmosphere of Peculiar, Missouri? I appreciate that—I think, when you’re writing something that’s a bit more dramatic, plays out scenically rather than internally, hearing that your book unfolding like a movie is one of the best compliments you can receive! Mostly, I was using my own surroundings. I’m a lifelong Missouri gal, and I live in Springfield, which is an even mix of urban and rural. It’s a medium-sized city (third largest in the state) with three universities; I live in a city-style neighborhood, but the end of my neighborhood is marked by a field surrounded with barbed wire. Barns, hay bales, horses, cows—you can see all that, less than two minutes from my house. I mentioned before that FERAL is a psychological thriller. It really follows so many classic conventions of the genre: Hitchcockian pace, attention to the main character’s psyche—even those feral cats are a nod to Hitchcock’s THE BIRDS. Psychological thrillers also frequently use water as a metaphor for the subconscious (the shower scene in PSYCHO, much of WHAT LIES BENEATH). The ice storm is also making use of the water metaphor—here, it symbolizes Claire’s frozen inner state, her inability to move on after a violent attack. Who were some of your favorite authors growing up, and did any of their stories or styles help you with the crafting of this novel? I mostly read contemporary realism. I’m a child of the ‘80s, so you can picture me in a perm and giant glasses, combing the library for Judy Blume books. I stumbled on a Christopher Pike book in junior high—FALL INTO DARKNESS—and I fell in love. I’d read a few mysteries before, of course, but this was the first adventure-driven book I’d read. There was something so compelling about it…I wound up reading every Pike book I could get my hands on after that. It made a big impact, that’s for sure. In the spirit of Halloween, and the scary thrill-ride that is FERAL, what’s something that terrifies you now? Or even something that scared you as a kid? Heights. I’m terrible with heights. Probably because my vision absolutely stinks—20/700. Yeah. I know. The silliest thing that makes my skin crawl? Slugs. Slugs drive me crazy. What’s a fun fact that no one knows about FERAL? It’s kind of a fun fact about me as a writer…If I want to completely turn off my inner critic, I take my glasses off while I draft. My eyesight’s so crummy, I can’t see the screen. If I can’t see the screen, I can’t get nitpicky. It’s cool when a “weakness” turns out to be a blessing in disguise, isn’t it? Interested in watching the book trailer? 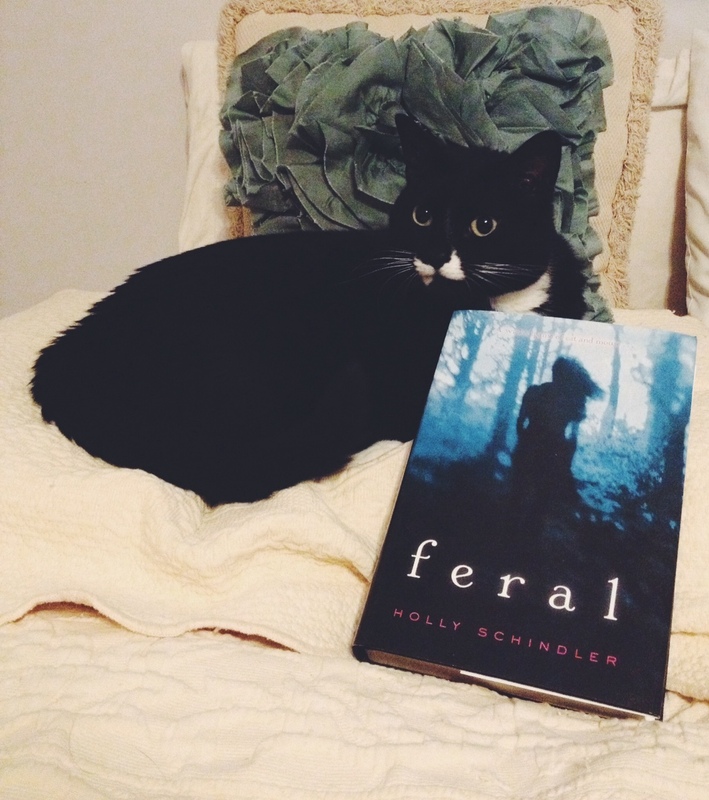 Check out the link by clicking H E R E.
Holly Schindler’s FERAL promised to be like THE LOVELY BONES meets BLACK SWAN and it did not disappoint. From the first two opening scenes, I knew this was going to be one of those true psychological thrillers, emphasis on the psychological aspect. I was cringing back from the pages, peering through my fingers, and feeling so utterly overwhelmed. I freaking LOVED it. Schindler did a phenomenal job with making the reader FEEL like they were slowing becoming unhinged and unbalanced right along with the main character. I love books with unreliable narrators, and Claire, the MC, is absolutely convincing in this role. It’s so hard to come across a contemporary novel that really takes the reader on a psychological mind melt, and this work has definite nods towards classic masters (like Hitchcock) in this genre. I felt myself questioning my own sanity and judgment of what was real and what could be fantasy with each new page I turned. The atmosphere in FERAL was also extremely well crafted. I could clearly picture being in this creepy, foggy town that lived up to its name of “Peculiar.” The entire cast of characters added to this haunted setting – and at times it felt like it had shades of Stephen King’s horrorlicious style. I love how King can make a small town absolutely terrifying, even by having a character simply walk to the store for some milk while you’re screaming “Look behind you!” only to realize that all is safe…for now. Schindler did that beautifully. You find yourself constantly on edge, wondering what horror is going to take place next, and questioning everyone and their motives. Characters are not all perfect, the good ones have flaws, and blemishes and chinks in their armor. It’s what being human is all about, and FERAL is great with delving into humanity. Victims of violence go through a multitude of emotions, and not all of them are going to be pleasant. Sometimes we have to learn who we’re not before we become the person we’re meant to be. I loved Claire. She had ups and downs, and I was right there with her throughout her journey. Hands down, I’d recommend this book to anyone who’s a fan of true psychological thrillers. Bella gives it two paws up as is evident in this pic. I had a wonderful opportunity to fangirl like crazy talk to Holly Schindler after I read the book, and am happy to share some of what she said with you tomorrow on the blog! In the meantime, Readers, who are some of your most memorable unreliable narrators? Interviewed by the fabulous A.G. Howard! Today I’m hanging out over at my dear friend A.G. Howard‘s blog, A Still And Quiet Madness. 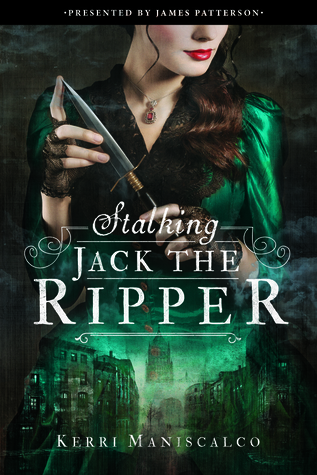 The uber lovely Anita interviewed me and I’m dishing for the very first time publicly some information on what my book is about… I don’t even have the quick summary up on my blog, so be sure to click on the link below! Anita’s debut (being published by Amulet) SPLINTERED hits shelves everywhere in January, so wander around her beautiful blog while you’re there! She also said some blush-worthy things and you should totally give her a giant hug for me. My Weekly Adventure: I’ve been interviewed! Guys, I’ve been interviewed! The lovely Aryn of the SUPER awesome Weekly Adventure Blog asked me a bunch of questions about writing, querying, books, books, books, and TONS more fun stuff about the whole road-to-publishing journey. WA: On your blog it reads, “Novelist by day… rogue foodie by night.” what is your very favorite style of food? WA: Tell me about your current book project. KM: The project that’s currently under consideration is a YA futuristic thriller. It’s set in NYC and is about a 16-year-old girl who’s unknowingly being turned into the ultimate biological weapon by a government obsessed with achieving genetic perfection. WA: What is your “dream” project? Hope you are having an amazing day! Can you believe it’s the second week of January already?! The very talented Eileen Andrews has been interviewing writers and getting an insiders look at where the writing magic happens. Guess who she interviewed? So if any of you charming lil’ lurkers want a look inside my writing space, check out the interview here. Here’s some of the interview, with just one teaser pic. You’ll have to check out the link for all the photos and the entire interview. 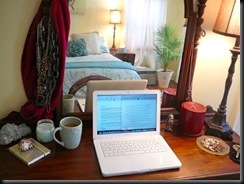 What’s the most important thing about your writing environment? Does it change regularly? Or do you require consistency? I’m a closet romantic, so the overall atmosphere is the most important thing about my writing environment. I light candles, keep favorite books close, and start typing. Some days I’ll switch it up and write in bed – just to be daring. As much as I enjoy spontaneity in life, my work environment remains pretty consistent. Do you have a writing talisman? Something to jump you into writing? So that’s exactly what I do now. I’ve gotten into the habit of writing every single day, even when I don’t feel ‘inspired.’ Amazingly, it works. Are you an evening or a daytime writer? What’s your writing schedule like? I’m a day into evening writer. Typically I write between eight and fourteen hours a day, six or seven days a week. Though, lately I’ve been trying for a more regular schedule to avoid getting burnt out. Ideally I’d love to write Monday through Friday for eight to ten hours a day. But I’m not very good at that whole cutting back thing just yet. Are you a pantster or a plotter? What do you like about your method? I’m a balls-out kinda girl, so it depends on what project I’m working on. The first book I wrote I was a complete pantster, and loved it. But with the second novel, I crafted a query letter first, then tried to make it work around that. I enjoy plotting basically for the challenge it provides. It’s like‘Okay, I’ve got an idea of what I’d like to do, but can I make it work on paper? Am I going to fail miserably? Is this a terrible idea?’ I love the feeling in the end when it all comes together. Then of course I start looking for the next challenge right away. Do you have a favorite book on writing? What made it so helpful? I don’t have a favorite book on writing per se. I took creative writing in high school and college, but I think reading in your genre (and as many other books as you can) is the most helpful tool any writer can call upon. What book or author has had the greatest impact on your writing career? This is a REALLY hard question. Lilian Jackson Braun, Sue Grafton and Janet Evanovich are a few contemporary mystery authors I just started reading. Shakespeare, Poe, Hemingway, Salinger, Frost & Dante have been longtime favorites. Kerouac’s Mexico City Blues is something I re-read periodically. Shel Silverstein is an author I was obsessed with as a kid. I’ve also been reading The History of the Peloponnesian War by Thucydides – it’s just amazing. I wouldn’t know where to begin with deciding the greatest influence! Basically they’ve all impacted my writing in some weird, eclectic way. What author would you break the law to meet? Find out my answer by checking out the link HERE.